Block Buster is the name of a line of herb-based hoodoo, conjure, or rootwork supplies that contain hot, fiery, and spiritually "explosive" herbs and minerals reputed in folklore to blow apart obstacles, especially those which were thrown or laid in one's path one by enemies or those which have prevented forward motion because of one's careless inattention to the accumulation of errors and blockages. Block Buster blows apart blockages and obstacles that have been thrown in front of you. If you have been thwarted, held down, sent back, closed off, or made to stop in your tracks, now is the time to blow apart the rocks and boulders in your road and make a path where there was none! 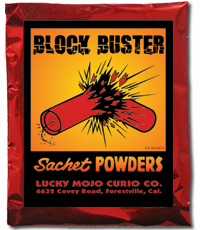 Block Buster Sachet Powder is used to draw designs on an altar to moving candle spells and to dust free-standing or figural candles that have been dressed with Block Buster Oil. It may also be mixed with local dirt and laid down in the path where someone is expected to walk, with a prayer to blow a hidden situation wide open, or to remove a stumbling block in the way.